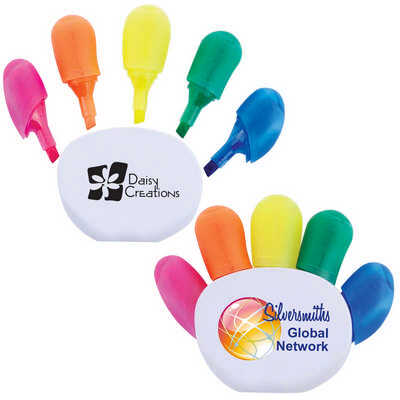 White hand shape highlight marker with 5 chisel tip highlight markers. Pink, Orange, Yellow, Green and Blue highlight finger colours with matching caps. Colours - White Size - 95 x 73 x 17mm (LxHxD) Decoration Area(s) - Pad Print : Front/Back - Rectangle 38 x 22mm (LxH); 4CP Digital Direct Print : Front/Back - Oval 53 x 36mm (LxH). Price includes : 1 Col 1 Pos Print. Setup is included.